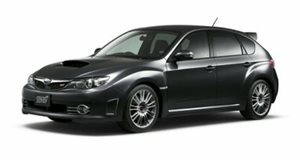 The all-new 2012 Subaru Impreza has made its official debut at this year&apos;s New York Auto Show. Taking a number of styling cues from the larger Legacy, the new Impreza also shares some styling from the concept version displayed at last year&apos;s Los Angeles Auto Show. Sadly, Subaru has also significantly watered down the designed from the concept, resulting in a rather unexciting production version. Subaru claims the new car will achieve 26/36 mph city/highway when equipped with the CVT transmission (a five-speed manual is also available). Considering Subaru&apos;s are all-wheel drive, these numbers are excellent. The transmissions are mated to Subaru&apos;s new 2.0-liter boxer engine that produces 148 hp. The automaker further claims the new Impreza is 30 percent more efficient than the outgoing model. The 2012 model also retains the same exterior dimensions as the 2011, while the interior size has increased, specifically in leg room and cargo space. The A-pillar has been moved forward by 8 inches, resulting in larger front doors and a re-angled windshield that gives the cabin a more spacious feel. Both four and five door versions will be offered and trim levels (2.0i, Premium, and Limited) will remain the same. Additionally, WRX versions are on the way, but we&apos;ll likely have to wait until sometime early next year.